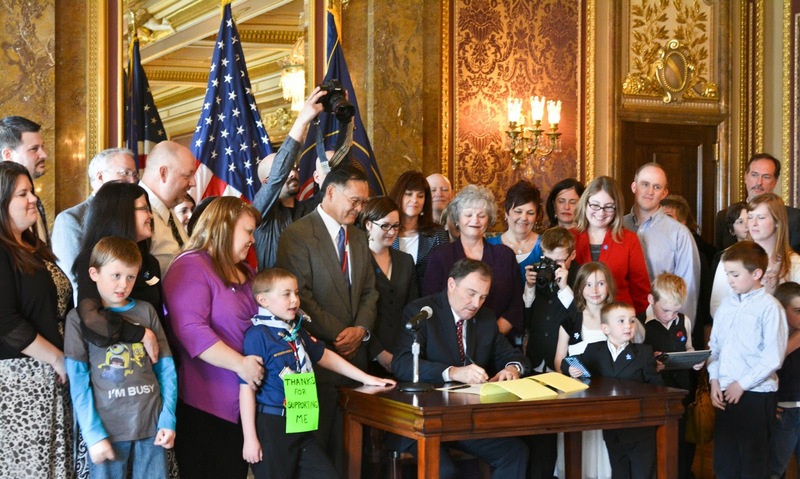 On Thursday, April 3rd, Governor Gary Herbert signed SB57 into law, making Utah the 35th state in the country to enact autism insurance reform. The law requires many state-regulated health plans to cover behavioral health treatments through age 9, speech, occupational and physical therapy, and psychological/psychiatric care. It will apply to insurance plans beginning January 1, 2016. The Utah Autism Coalition thanks Senator Brian Shiozawa for championing this cause with intelligence and determination. It's been a six year effort to reach this point, and we thank all of the advocates who have made it happen, especially past UAC presidents Leeann Whiffen and Mirella Petersen. Autism Speaks has been an invaluable resource to us. At the same ceremony, Governor Herbert signed HB88 into law, turning the state's autism treatment pilot into an on-going program. The UAC thanks Representative Ronda Menlove for all her efforts on the behalf of the autism community over her career. Her voice will be missed in the legislature. We thank Governor Herbert for his stalwart support of the autism community and the Utah legislature for listening to our stories and acting on them.